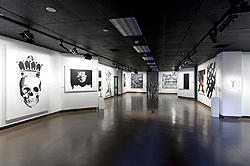 Situated in the Visual Arts Building at La Trobe's Bendigo Campus, the Phyllis Palmer Gallery is a space dedicated to showing new work by graduates, current students and associates of La Trobe Art Institute as well as the wider community. The gallery is committed to showing the most diverse range of art works, from paintings, sculpture and ceramics to photography, graphic art and new media. We aim to present innovative work – particularly that founded in contemporary ideas – to the widest possible audience. We are situated in the Visual Arts Building on La Trobe University's Bendigo Campus (find out how to get to the Bendigo campus). Enter from Sharon St via Gate 8 and Arts Drive. Street parking is available in Sharon or Keck Streets. On-campus parking is only available after obtaining a visitor's parking permit. Disabled parking is available and the gallery is wheelchair accessible.